I went to this really awesome antique store a few weeks back with my friend, Kristin, and purchased this antique side table! For those in the Atlanta area, it’s called Woodstock Market Antiques. I loved it so much despite its quirks and all the things that make antiques so fun. I loved the blue color, but it clashed with our nursery walls so I decided to use my trusty chalk paint and paint it white! Here are the before and afters. I used this Americana chalk paint again in the color “Everlasting” and used one of my favorite Wooster Pro brushes to get the job done. 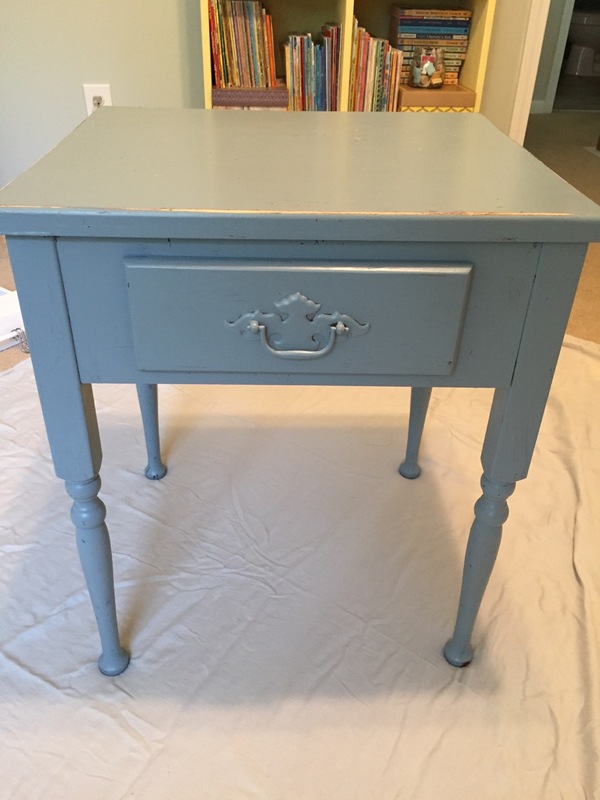 I talk in this post about about why I love Americana chalk paint so much. If you’re pregnant like me and you do decide to paint, just choose a paint that is water based, acrylic and as non-toxic as you can find. Most paint stores sell low VOC paint and “green” paint that is safer to use while pregnant. Turn on fans, open windows, wear a mask or gloves or do the project outside. I talked to my doctor before painting and researched the paint before use, so be sure to do the same if you are in nesting mode like me. 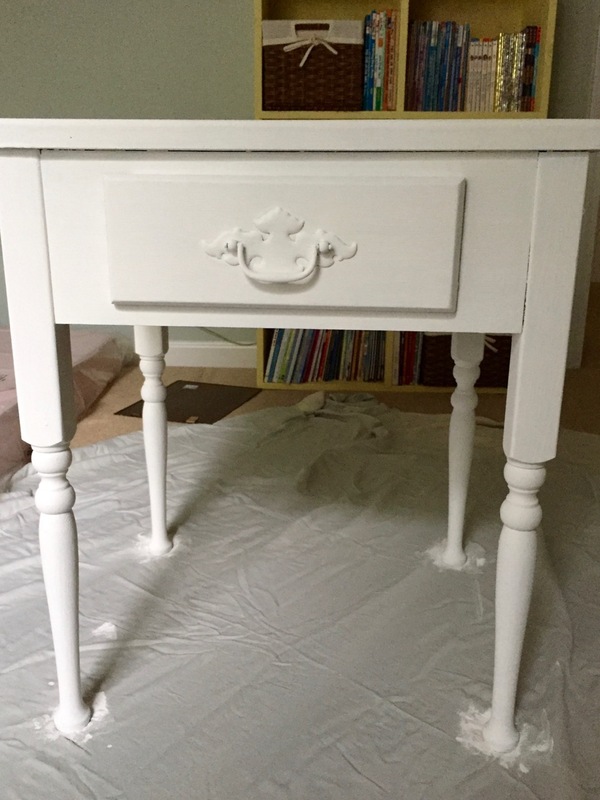 Here’s the finished product after three coats of white chalk paint. I love how the chalk paint still lets brush strokes show and sometimes even lets you see through to the old color. I think it gives the piece even more character. If you want to, you can apply even more coats to fully cover whatever is underneath. Remember, with chalk paint, there’s no need to prime or prep your work surface…just be sure to at least wipe off your project before applying paint! Some people apply a wax or sealant after applying chalk paint, but I never do. 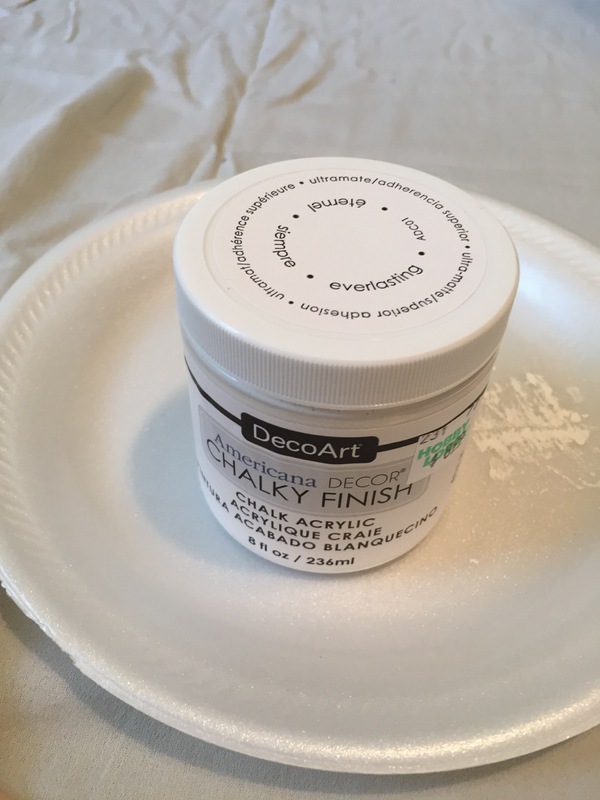 Also, if you ever need to touch up chalk paint, its very easy to do and always blends in with the old chalk paint. Can’t wait to get all of these little projects set up together in the nursery!